The top vine has appliqued flowers; the side vine does not. I'm continuing to work on my current UFO ... a hand-dyed Lone Star that I started in 2011. 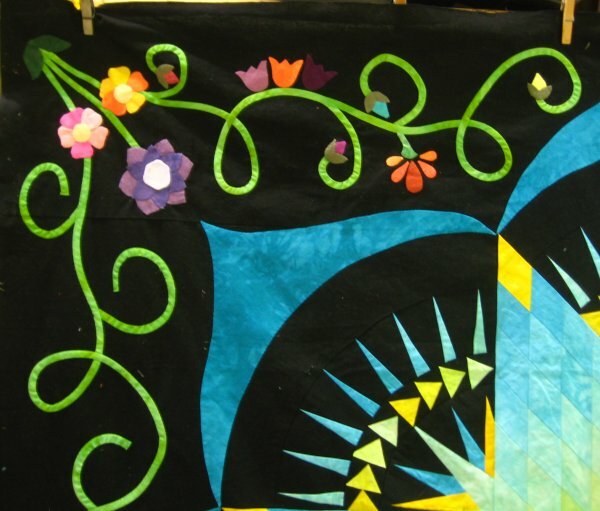 Appliqued vines, flowers and leaves are being hand-appliqued around the perimeter. And that's the phase I'm at right now. 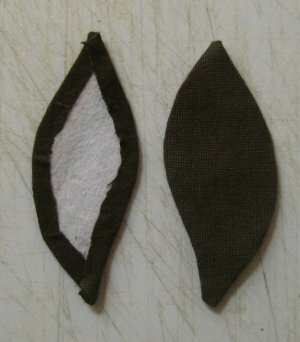 There are all sorts of techniques for hand applique, most of which I thoroughly detest for various reasons. I don't say this to disparage any one technique but to be up front that I have *tried* many techniques and found that they just do NOT work for me. UNTIL I was introduced to fusible, water-soluble stabilizers by a quilting buddy of mine, Suze Noonan of California. Suze uses stuff she bought from Floriani (the exact product name escapes me), which comes on a roll. I'm using C&T Publishing's "Wash-Away Applique Sheets" which come in 8.5"x11" sheets. (That size will come in VERY handy in just a minute). There are others that you can use. The key thing is that it needs to be FUSIBLE on one side and WATER-SOLUBLE. My stuff looks very much like non-woven interfacing. 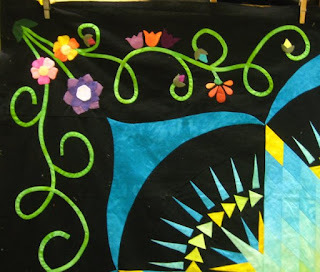 After I had all the flower bud appliques made and I could see all the colors I had, I pinned them in place. I really do like hand applique. But the prep work was horrendous. Suze's method (which she will be the first to admit that she did not invent) has you draw your applique template onto the stabilizer, cut the template out on the FINISHED shape line, fuse the template to the wrong side of the applique fabric, cut out the applique fabric leaving a small seam allowance, wrap that seam allowance to the back of the template and glue the seam allowance down. Voila .. you're done. The beauty of this technique is that you LEAVE the stabilizer IN when you are quintupling the shape to the foundation fabric. When you launder your project, the stabilizer will *wash away*, leaving just the applique fabric on the foundation fabric. How easy can that be? Gosh, I love it. Finished applique is at top left. Piece parts are directly below. The rest are units to be worked on. What I LOVE about C&T's product is that since it is 8.5"x11" sheets, you can run them THROUGH YOUR PRINTER. Why is that earth-shattering? Well ... in your graphics editor program (I use Paint Shop Pro), create a page and draw (or scan in) your applique piece templates. 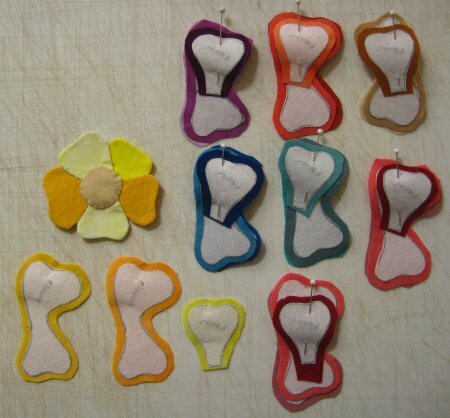 Copy each of your applique template onto the new page. Crowd them to maximize the use of the 8.5"x11" because you're going to be cutting them out afterwards. What you now have is a page-size "picture" of your applique pieces ... that you will now PRINT onto the C&T sheets. *No need to manually draw each applique template!!! * Let your printer "draw" them for you! All you need to do is to cut them out on the lines (which is the final size of your applique piece). 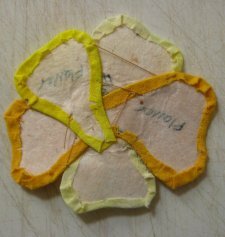 back of the 5-petal flower, showing wrapped and glued seam allowances. 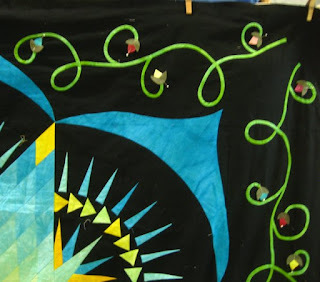 Fuse those templates onto the wrong side of your applique fabric, cut them out leaving a small seam allowance, wrap the seam allowance to the back and glue it down. You are DONE! So fast and easy! 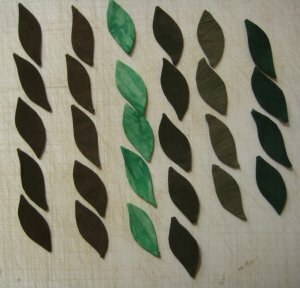 All the leaves I've made so far. Some of the donation quilts are actually ready to donate. Some are 100% quilted but not bound. 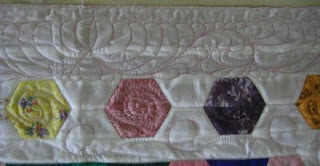 But a lot of them are still tops, needing to be quilted. And that's how my motivation has been this year: I get all fired up to get a quilt done ... and then run out of steam by the time it comes to quilting it. However, here's what I've accomplished this year so far. I suspect that even though it is only October, this is as far as I'll get with respect to the creation of any more donation quilts. That particular bee in my bonnet has been chased away and I'm more interested in completing other UFOs than this bunch. Never fear, though, eventually all of these tops *will* get quilted and the whole bunch will get donated. 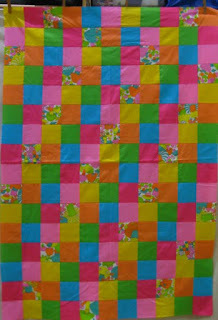 This is "Audrey's Brights" and was made from the stash of my dear sister-in-law's mother who had passed away. These are REALLY bright cotton-poly squares, just sewn together in no particular order or fashion. It's still an unquilted top. Once the above quilt, "Audrey's Brights" was done, I had EVEN MORE of the really bright fabric leftover and created "Audrey's Bright Hearts". So, I cut hearts from the brightly printed fabric, and fused them as appliques to be the focus squares. I surrounded the hearts with the really bright fabric. I had a lot of fun making these fused appliqued cupcakes! I alternated the cupcake blocks with 4-patch blocks and did an all-over pantograph. 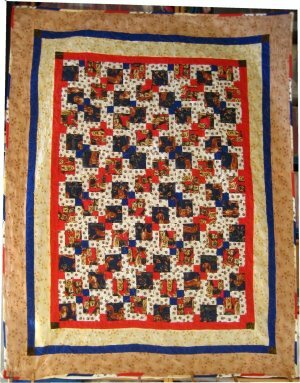 Yup, this one is actually quilted! 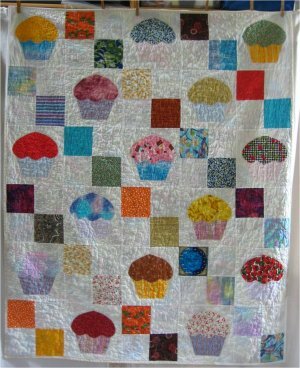 The backing is a piece of fleece yardage that is an all-over print of cupcakes ... which is where I got the inspiration for the top. Somewhere along the way, I picked up some fleece that had dog bones printed all over. I haven't a clue where it came from, as I'm not really a dog person. But to coordinate with the dog bone fleece, I dug into my stash and found two chunks of fabric with dog pictures on them .. one with a red background and the other with a blue background. Once again, I don't know where the dog fabric came from. It certainly didn't look familiar! I can only assume it was given to me. 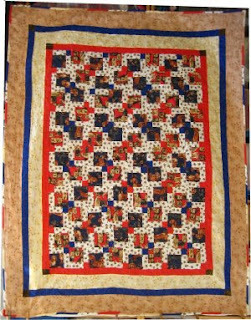 I have accent squares of red and blue fabric and used a paw print fabric as a sashing of sorts. I *think* this is a disappearing 9-patch pattern, but I didn't say anything about that in my notes, so I'm not completely sure. These are "doodle cloths" that, once I had completely used up the fabric with my doodles and practicing, I cut them up and bound them to be used by my veterinarian as liners in the cages where their animal clients are kept. These doodle cloth quilts are puffier than the thin terry towels the staff normally uses to insulate the animals from the wire mesh bottom of the cages. I'm happy to not throw away the doodle cloths; the vet is happy to get substantial cage liners; the animals (I imagine) are happy to lay on something more comfortable. This donation quilt is a complete disaster, I'm sad to say. I did have a layout that I used as an inspiration but because I didn't have enough of the pre-printed hexagon fabric to replicate the original layout, I had to come up with something else. And .. yuck ... this was it. I'm not happy with it BUT not unhappy enough to rip out all the appliqued hexies and figure what else to do. It'll remain as it is. Sometimes quilts just turn out yucky. This quilt was inspired by another hexie layout that turned out differently from the original. But in THIS case, I'm happy with the finished quilt! I used this top as an opportunity to try a different feather motif in the borders. I really do enjoy quilting feathers. Once I "discovered" the 'hump and bump" method that Karen McTavish uses, it made sense to me and I could actually *do* them with some degree of attractiveness. Now, it's the only method I use for feathers. And here's a close-up of the feather motif. I'm really rather pleased with the way it turned out. 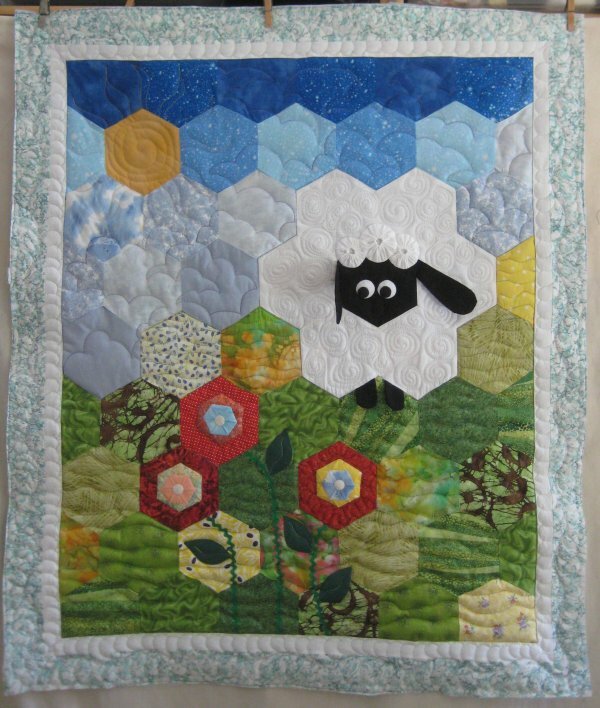 "Sheep in the Meadow" is a pattern designed by Deonn Stott and appeared in the May/June 2014 issue of Quiltmaker magazine. 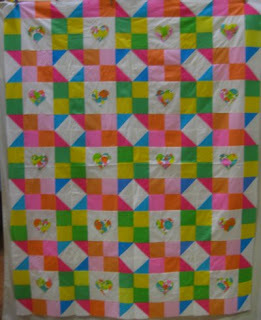 I came across it just last month when I needed to make a baby quilt for a cousin. 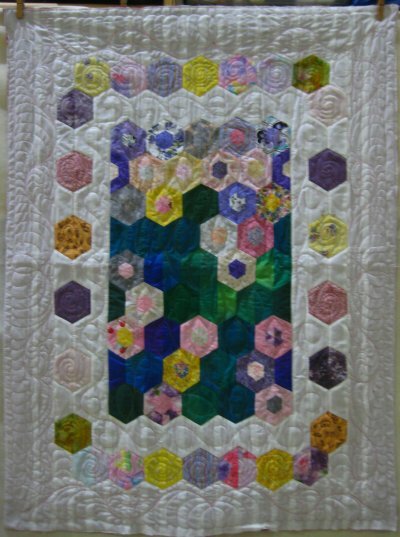 I used 3" (along the side) hexagons, which resulted in a small top, so I added 2 fabric borders to bring up to acceptable size. 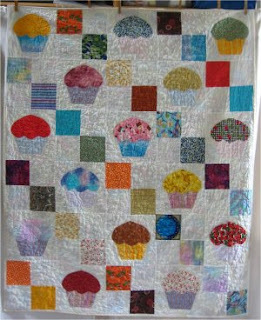 This quilt is Just SOOOOO Cute! The ears and legs are floppy, free-swinging appendages; the eyes are double layered appliqued circles ..and don't forget the yo-yo's on the sheep's forehead! 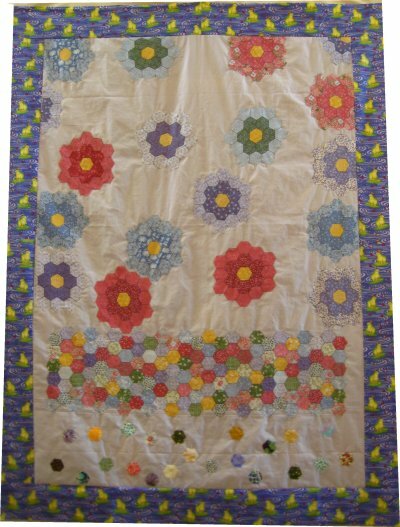 The flowers in the meadow are double layer fabric origami and add just the right amount of texture to the quilt. That was just a teaser for you! Please wander on over to Sheep in the Meadow for more, detailed pictures and verbiage.